"Drink for a Cause" and support City of Oak's Give Play program! Support the City of Oaks Foundation's Give Play Program by giving on-line and then coming out to Boxcar Bar & Arcade to play games, drink beer, and bid on cool silent auction prizes at our Happy Hour Fundraiser on Wednesday, October 25th from 5:00pm-7:00pm. Our Give Play program helps under-resourced children around Raleigh attend outdoor, active summer camps and nature programs through the City of Raleigh's Parks, Recreation & Cultural Resources Department. Your donations will help send local kids to camp in 2018. Boxcar Bar & Arcade gives back to local charities through their "Drink for a Cause" Wednesdays. A percentage of all beer sales on October 25th will also be donated to the Give Play program. You can support our Give Play program three ways. You can give on-line using the donation button on this page (or the one on our website), you can make the winning bid on one of our silent auction prizes, or you can just purchase a beer from BoxCar on Wednesday, October 25th and a portion of your purchase will support the Give Play program. Each year hundreds of children who want to participate in the City’s summer camps and nature programs do not because their families can’t afford the fees. The Foundation’s Give Play program offers elementary and middle school aged children the opportunity to get outdoors and connect with nature, and to have fun and build social skills along the way. By underwriting scholarships, we help children develop an appreciation for the natural world and we get them outside and active, developing healthy habits that last their lifetimes. Our Happy Hour Fundraiser is Wednesday, October 25th from 5:00pm - 7:00pm at Boxcar Bar & Arcade at 330 W Davie St. in Raleigh (next to The Pit BBQ restaurant). Several silent auction items will be available during Happy Hour. Bids will be taken on-line at the event, through 7:00PM. We have a growing list of sponsors who have donated prizes for our Silent Auction. Scroll through our gallery of autographed photographs, movie posters, sheet music, and celebrity sketches! How can I bid on these auction items? Do I have to be present to bid! Our Silent Auction will be held on-line, so you do not have to be present to bid. It will open at 5pm on Wednesday, October 25th and close at 7pm that same evening. Access the on-line auction at this site: https://www.32auctions.com/COFGivePlay17 to create an account. All bidding and payment must go through the on-line auction site. We suggest creating your bidding account in advance of the auction! How do I claim any items I have won? 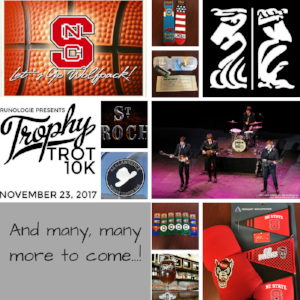 The City of Oaks Foundation will not ship items won in the Silent Auction.so you will need to be able to pick up any prize won at the auction, or from our offices in Raleigh. All items may be picked up from the Happy Hour Silent Auction at Boxcar Bar and Arcade - 330 W Davie Street, Raleigh, NC - after the conclusion of the auction at 7:00pm on Wednesday, October 25th. Any items not claimed at the end of the auction may be picked up by appointment at 222 W. Hargett Street, Suite 608, Raleigh, NC 27601 before Friday, Nov. 3rd. Failure to claim an item by this date may result in forfeiture of the item. Boxcar Bar & Arcade is a bar, so while children accompanied by a parent are welcome, parents should be aware that patrons will be consuming alcohol on the premises. Guest should bring proper identification if they wish to order an alcoholic beverage. As the hour gets later, Boxcar reserves the right to only admit individuals of legal drinking age. Contact the Foundation at 919-996-4773 or at info@cityofoaksfoundation.org. Older PostCelebrate OAKtoberfest with the City of Oaks Foundation!